Part Used : Bamboo Leaves, Bamboo Exudate, Banshalochan, Tabasheer. Habitat : Through out india, in areas upto 2100 m elevation. 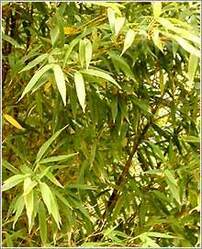 Uses : The leaves are sweet, astringent, cooling, emmenagougue, ophthalmic, vulnerary, constipating and febrifuge. Bamboo leaves contain the highest protein levels, stems have less. The bamboo resin (Tabasheer, Banshalochan) is the siliceous secretion found in the internodes of the stems of various species of Bamboo. It occurs in fragments of masses, and is translucent or transparent and bluish white color. It is astringent, acrid, sweet, cooling, expectorant, constipating, cardiotonic, haemostatic, aphrodisiac and diuretic. The sprouts are acrid, bitter, laxative and are useful in inflammations, ulcers and wounds. Extract is used to treat various inflammatory conditions.